Finally! It’s all in one place. This Chakra Chart is complete. Learn all about the chakra names, locations, colors, sounds, crystals, yoga postures, breath work, goddess archetypes, psychological & energetic influences and more. It’s laminated and 81/2″ by 14″ with information on both sides. This chakra chart is handy and helpful! Learn more about chakras here. How To use the chart for balancing your chakras. Begin by familiarizing yourself with the chakra names, locations, and characteristics of each chakra. Here are some ideas for getting started. Balanced Chakra Energy: Maintain balance with continued healthy attitudes, behaviors, emotions and appropriate yoga postures, breathing practices and activities. Excessive Chakra Energy: Use the chakra’s balancing color. Chant or sing the vowel sounds to send and release excess energy. “Too much of a good thing” is harmful so decrease behaviors that are excessive. Deficient Chakra Energy: Use the chakra’s emanating color. Chant or sing the bija mantra sounds to increase and attract energy. 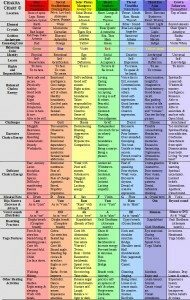 The Chakra Chart was originally published in Yoga Meditations: Timeless Mind-Body Practices by Julie Lusk. Sources include Anodea Judith, Jeff Migdow, Barbara Pritchard, Gene Jackson and Rosalyn Bruyere.